A Times graphic shows the problem of passengers caught between the streetcars and lanes of traffic. Broadway and 7th Street in 1934, showing a man crossing through a lane of traffic to get to a streetcar. Notice that the driver is using hand signals to indicate a turn. Also notice the police officer directing traffic in addition to the traffic semaphore. Dec. 14, 1912: I am probably too fond of saying this, but traffic in Los Angeles is not a new problem: It’s more than 100 years old. 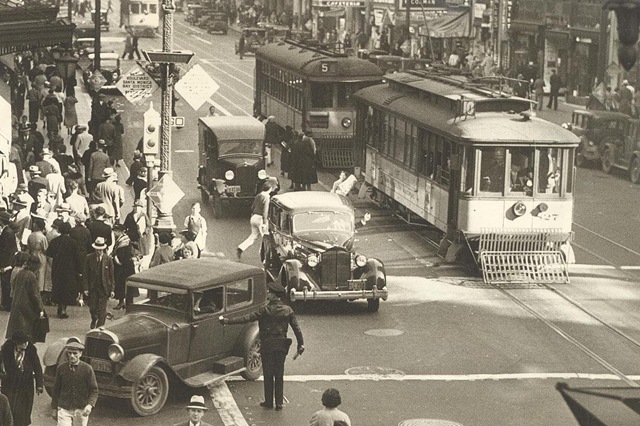 Here’s a lesson from history to those who are bringing the streetcar back to downtown Los Angeles. Using a rather jocular tone, The Times describes a proposed ordinance that bans vehicles from standing within 120 feet of intersections in the congested downtown area The idea is to solve the problem of passengers who board or get off a streetcar and must navigate through a lane of moving cars and a second lane of parked cars to get to the curb. The Times says this rule is already being enforced at Broadway and 5th, 6th and 7th streets. Another proposed regulation is making it illegal to “stop, stand or hitch any animal or vehicle upon any street in the congested district with a few exceptions between the hours of 8 am. and 6 o’clock p.m. of any day for a longer period than 20 minutes.” The current limit was 30 minutes. It will be interesting to see how the streetcar of the 21st century will address these problems. This entry was posted in 1912, Downtown, Streetcars, Transportation and tagged #DTLA, 213, Broadway, downtown, Streetcars, transportation. Bookmark the permalink. Streetcars work, I’ve ridden them in Toronto, Vienna, San Francisco. San Francisco and Europe have been using them for over 100 years, so that says something.